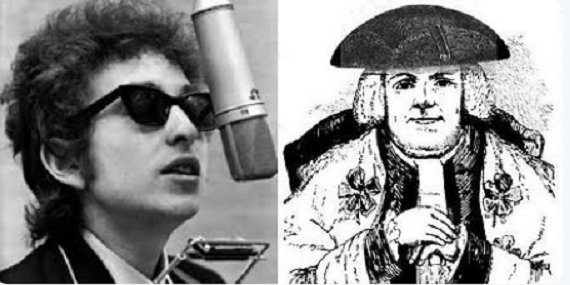 A new exhibition in the members’ reading room at the Faculty of Advocates explores the connection between the Faculty, Bob Dylan and a 17th century Scottish ballad. The display was written by Alistair Johnson, of the Advocates Library, and has its roots in a casual glance through a newspaper. Alistair, a folk music fan, said: “I was in a cafe and opened my paper and saw an article about the Bob Dylan song, A Hard Rain’s A-Gonna Fall. I read the lyrics and it immediately struck me that he had based the song on an old traditional Scottish ballad, Lord Randall. “The ballad has murder as a theme, and Dylan’s song is about nuclear holocaust, but it is very much in the same style of asking questions at the beginning of the verses. Edward was included in Thomas Percy’s Reliques of Ancient English Poetry, a collection of English and Scottish traditional ballads published in 1765 which found much favour in Germany. The writer, Goethe, was so impressed by the quality of the songs that he adopted the ballad style in more than 160 poems. The ballad which made the deepest impression was Edward and Goethe recited it at dinner parties.